The Kindertransport was the movement of German, Polish, Czechoslovakian and Austrian Jewish children to England before the outbreak of World War II. On November 15, 1938, a few days after Kristallnacht, a delegation of British Jewish leaders appealed in person to British Prime Minister Neville Chamberlain requesting, among other measures, that the British government permit the temporary admission of children and teenagers, who would later return to their native countries. The Jewish community promised to put up guarantees for the refugee children. their arrival in London on the "Warsaw". The following day, the issue of giving refuge to Jewish children was debated in the British cabinet. Home Secretary Sir Samuel Hoare said that the country could not admit more refugees without provoking a backlash but Foreign Secretary Lord Halifax suggested that such an act of generosity might have the added benefit of prompting the United States to accept additional immigrants. The cabinet committee on refugees subsequently decided that the United Kingdom would accept unaccompanied children, ranging from infants to teenagers under the age of 17. No limit to the number of refugees was ever publicly announced. Secretary Hoare announced the program to the assembled members of the British Parliament at the House of Commons, who broadly welcomed the initiative that would come to be known as the Kindertransport. Within a very short time, the Movement for the Care of Children from Germany - later known as the Refugee Children's Movement (RCM) - sent representatives to Germany and Austria to establish the systems for choosing, organizing and eventually transporting the children. On November 25, 1938, the BBC Home Service radio program aired a public appeal for British citizens to volunteer foster homes and quickly more than 500 offers were received. The RCM did not insist that prospective homes for Jewish children be Jewish homes nor did they probe too deeply into the motives or character of the foster families - it was sufficient for the houses to look clean and the families to seem respectable. In Germany, a network of organizers was established and these volunteers worked around the clock to make priority lists of the most imperiled teenagers who were in concentration camps or in danger of arrest, Polish children or teenagers threatened with deportation, children in Jewish orphanages, those whose parents were too impoverished to keep them or those whose parents had already been sent to a concentration camp. The first Kindertransport from Berlin departed on December 1, 1938; the first from Vienna on December 10. For the first three months of the transports, the children came mainly from Germany and then the emphasis shifted to Austria. In March 1939, after the German army entered Czechoslovakia, transports from Prague were hastily organized and transports of Jewish children from Poland were also arranged in February and August 1939. The last group of children from Germany departed on September 1, 1939, the day the German army invaded Poland and provoked Great Britain, France, and other countries to declare war. The last known transport of Kinder left from the Netherlands left on May 14, 1940, the day the Dutch army surrendered to Germany. Tragically, hundreds of Kinder were caught in Belgium and the Netherlands during the German invasion, making them subject once more to the Nazi regime and its collaborators. Upon arrival at port in Great Britain, Kinder without prearranged foster families were sheltered at temporary holding centers located at summer holiday camps on the cold windy coast of East Anglia – Dovercourt near Harwich – and, for a short period, Pakefield near Lowestoft. Finding foster families was not always easy, and being chosen for a home was not necessarily the end of discomfort or distress. Some families took in teenage girls as a way of acquiring a maidservant. There was little sensitivity toward the cultural and religious needs of the children, and, for some, their heritage was all but erased. A few, mainly the youngest, were given new names, new identities and even a new religion. In the end, many of the children for whom no home could be found were placed on farms or in hostels run by the RCM. From the moment of their arrival, the children struggled to maintain contact with their parents. At first, letters between parents and children flowed fairly easily and many were filled with hopes and plans for reunion. The beginning of the war in 1939 meant the end of this dream. In addition, the German government restricted the delivery of mail to and from Jews, forcing parents and children to rely on intermediaries or the Red Cross. By 1942, many of the children stopped receiving letters for reasons they would not understand until later. Older children suffered a different hardship. In 1940, the British government ordered the internment of refugees from enemy countries aged 16-to 70-years-old – so-called "enemy aliens." Approximately 1,000 of the Kinder were held in makeshift internment camps and around 400 were transported overseas to penal colonies in Canada and Australia. On one shipment to Australia aboard the HMT DuneraI, many of the Kinder were mistreated and a scandal that followed revelations about the mishandling of internment led to a program of releases in late 1940. Men in particular were offered the chance to do war work or to enter the Alien Pioneer Corps. About 1,000 German and Austrian teenagers served in the British armed forces, including combat units. Several dozen joined elite formations such as the Special Forces where their language skills could be put to good use. Most of the Kinder survived the war and some were even reunited with their parents who had either spent the war in hiding or endured the Nazi concentration camps. Reunions were not always happy as children had grown and changed and their parents were also changed by what they had undergone. The majority of children, however, had to face the reality that home and family were lost forever. 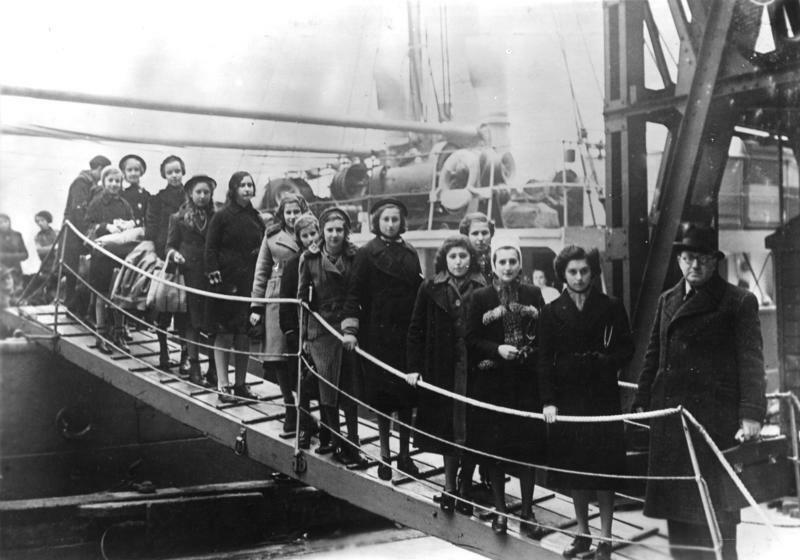 In all, the Kindertransport rescue operation brought approximately 10,000 children to the relative safety of Great Britain – a large-scale act of mercy unique in a tragic historical period marked by brutality and widespread indifference. In December 2013, approximately 150 guests, predominantly Kinder and their families, attended a ceremony marking the 75th anniversary of the first Kindertransport near the Liverpool Street Station in London. During the service, a speech was read on behalf of the secretary of state for communities and local government, the Rt. Hon. Eric Pickles, in which he reiterated the duty of the British government to ensure that the horror of the Holocaust is not forgotten. Pickles also emphasized the immense contribution the Kinder have made to British society and acknowledged the work of the Quakers in the rescue effort, as well as the numerous Christian families who took in children. Toby Axelrod, “Germany will compensate Kindertransport survivors $2,800 each,” JTA, (December 17, 2018).